The Brand-New 2017 Toyota RAV4 Earns Plaudits Everywhere! You Are Here: Home > The 2017 Toyota RAV4 Gets Rave Reviews! The 2017 Toyota RAV4 Gets Rave Reviews! Oh, the 2017 Toyota RAV4, how do they love you? Let us count the ways. Toyota’s new RAV4 is earning plaudits from some of the best-regarded consumer guides in the industry for its dynamic engine, excellent fuel efficiency, wide spectrum of sophisticated technologies, and powerful array of safety devices. In particular, Edmunds, Kelley Blue Book, and Car and Driver have focused praise on the RAV4, which should be more than enough to convince Hilton Head Island and Savannah drivers to make a visit to our Savannah Toyota dealership to test drive this awesome new car. But let’s get some details first. 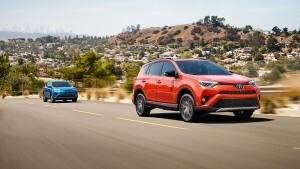 Edmunds is especially excited about the RAV4 and knows that it is the perfect vehicle for drivers in the area. In fact, they state, “Car shoppers in this hot segment get a new, upscale version of the 2017 Toyota RAV4 to put at the top of their consideration lists.” So if you want a vehicle that’s sure to impress, this is the one that will do it. Car and Driver is especially enamored of the RAV4, exclaiming “Its angled headlamps and sharply creased bodywork give the RAV4 an assertive presence, but don’t be fooled—under the skin, it’s a practical, comfortable, and easygoing bute.” Car and Driver gave this vehicle 3.5 out of 5 stars. Test Drive the Toyota RAV4 Today! Savannah Toyota invites drivers from Hilton Head Island and Savannah to come on by and test drive the all-new 2017 Toyota RAV4. Simply visit out dealership at 11101 Abercorn Street in Savannah, or give us a ring at (855) 411-6139 to arrange a test drive. Learn what all the critics are talking: explore the 2017 Toyota RAV4!